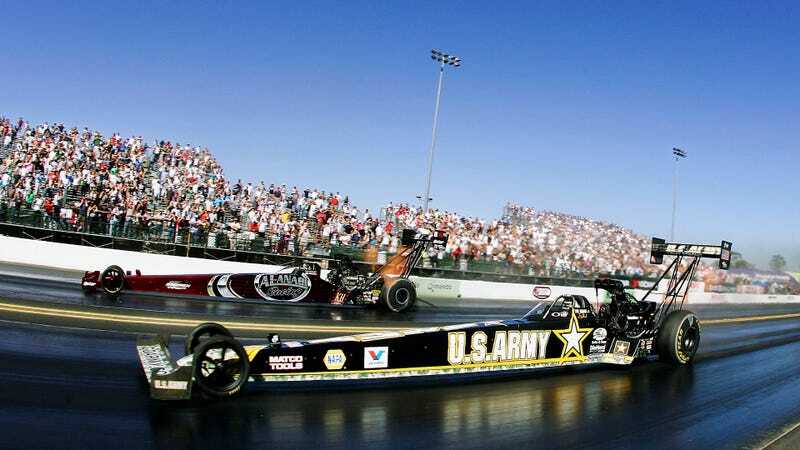 Drag racing seems simple at first, but the more you look into the sport where whoever crosses the finish line before the other wins, the more complicated and fascinating it becomes. One such example is called “spindle stagger,” or why top cars in drag racing don’t have front wheels that line up exactly. Again, the principle of drag racing is very simple. You have a set distance and whichever car goes from start to finish before the next car wins. Something I had never given much thought to: where is the starting line, exactly? Well, in drag racing you sort of need to have two. We’re all familiar with how drag racers are started off of a tree of lights, but what triggers those lights to know that you’re in place are two sets of staging beams that shoot perpendicular across the track. Trip the first beam and you’re “staged.” Then the lights can go. Trip the second and that’s where you’ve officially started. As you’ll note, there are THREE beams here, because nothing in drag racing is simple. There’s the Pre-Stage beam, the Stage beam and the Guard beam. What never occurred to me is that drag racing is so competitive, even the space between the two timing beams is critical. This came up in a recent Hoonigan video, in which the crew goes to Don Schumacher Racing and practices running for reaction times with funny car driver Tommy Johnson Jr. In the vid they go over how you can stage shallow or stage deep, either juuuuuuust tripping the first beam and then having more room for the car to accelerate or tripping the first beam late, rolling a bit past it and then getting what the beams would sense as a faster reaction time. It’s at about 19 minutes in the video above, or at 18:30 if you want to see the whole segment. Ignore the GT-R in that image and skip ahead and you’ll get to the drag racing, have no fear. Remember, this is a space of six inches we’re talking about here. For cars that make 11,000 horsepower. Johnson Jr. goes on to note that a few inches at the start of the race could mean a couple of feet at the end of it, and a worthwhile potential advantage. But it comes with tradeoffs. So you can gather how there’s pros and cons of staging shallow or staging deep, of having your front wheels way ahead of that first staging beam or only just after it. But! There is a way to do both. This is what’s called “spindle stagger,” meaning that the front spindles (what the wheels mount to) are set up with one wheel ahead of the other. That way the car stages both deep and shallow at the same time. A younger Tommy Johnson Jr. in 1996. Stagger in a the front tires gives the starting beams a larger target that will give a longer roll out. What will this do? This will give your car a running start at the starting beams﻿. Back in the day, guys figured out if you could stagger the front wheels so you stage ’em with [the front one]﻿ and as you leave the other one’s trailing behind it, the beam doesn’t start until the last wheel comes out of it. So you’re getting a huge advantage. You’re getting the car rolling before you start the clock. So they put a kibosh to that. Spindle stagger, like all cheat-ey aspects of racing, is tightly regulated to the fraction of an inch, but usually sits between one and two inches allowed depending on what class of drag racing you’re doing. So this is why the left side of drag racing cars is usually longer than the right, if by only an inch or two. It’s a fascinating little aspect of the sport I had never really considered, a grey area that’s wonderfully emblematic of how auto racing really works.